LILY ALLEN FOR CHANEL: The First Pic! Not the best picture in the world, but it gives us a wee taste of what the Lily Allen CHANEL campaign is going to be like – and frankly, I actually can’t wait to see more! The composition looks nice 🙂 I’d like to see more images of Lily’s face though! Hurry up CHANEL! What do you think of Lily and CHANEL? My Wardrobe Favourites: Bleeding CHANEL Tee. 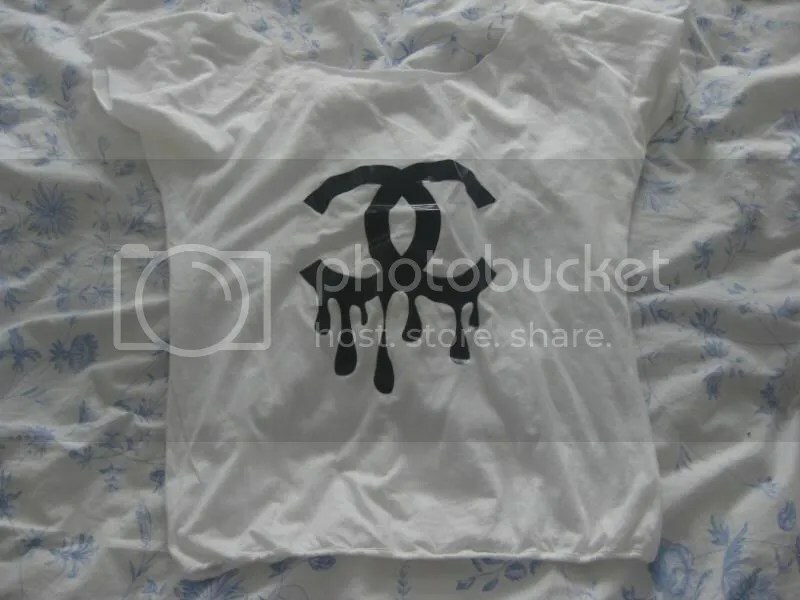 I got this amazing CHANEL Tee for Christmas from James. It’s got a slashed neck which can sit off one/both shoulders; very pretty. The credit crunch has hit our wallets, but not our humour or aspiration for that quilted CHANEL bag! I know this is slightly old news, I haven’t had time to get round to writing about this yet! Sorry guys! Also, apologies for this very suddenly turning into a CHANEL blog! Unfortunately, Chanel happens to be my favourite fashion house, so thats probably why I’m leaning more towards Chanel at the moment…. It has apparently been confirmed that British muscian and fashionista Lily Allen has been picked as the newest face of Chanel by Mr Karl Lagerfeld himself. Lets be honest, it’s been on the cards for yonks! Lily is always front row at fashion weeks, whether that be Chanel or not, she’ll always be sporting at least one piece of Chanel. She owns dozens of Chanel handbags – and is most often carrying (rather roughly sometimes – which does upset me somewhat) the grey large camera bag. I have to say I was, and still am, in two minds about this collaboration. I on the one hand, think its great. I actually quite like Lily now – although it was only last year she went a little bit mental and dyed her hair blonde-ish and then pink… and only a year before that when she was wearing the hideous prom dress/trainers combo. BUT how she has bloody well blossomed! Just look at her in the picture above, quite the ‘Chanel Girl‘. It makes me smile. But still, what would Gabrielle Chanel say? Surely she’d be turning in her grave? Hmm. I’m not so sure. One thing I am sure about is I’m very excited to see the shoot and the campaign. I’m sure she’ll look amazing. She’ll be the face of the leather goods – about right really considering she’s never seen without the aforementioned leather goods in question! What do you think? Good or bad decision on Mr Lagerfelds part? This is an expensive obsession…. Definitely found my next bag purchase… It’s the Navy Jumbo Classic Flap with Gold Hardware. I want this in the Caviar – does anyone know if this is available? Only seen it in the lambskin (as below). Already tired of my grey lambskin. It just does not hold its shape well AT ALL. I also believe that the caviar leather actually looks more expensive than the lambskin too – much better quality! This is absolutely the case when looking at both the black and grey classic flaps I have…..
I’ve seen that the retail price for this one (as above) is around $3,000. Any idea what this would translate to in GBP (£) and of course, in the Caviar leather as opposed to the lambskin? 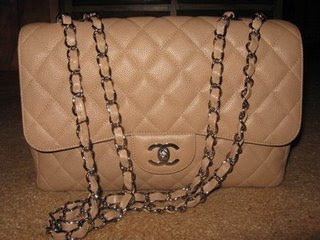 Theres so many beautiful Chanel pieces I’m desperate to purchase – more blogs to follow this one! I hate having to save! Rubbish! Say hello CHANEL – “Chanello”. I’d have to have this in the gold hardware though! Any other ideas or suggestions?